On behalf of a mining company owned by John D. Rockefeller, the National Guard used a machine gun on workers and their children, then burned them alive. Then one day, these tensions came to a head and the National Guard set up a machine gun on a hill overlooking the tent city and began raining bullets down on the workers and their families. The Soldiers then invaded the colony and began setting fires to the tents, trapping many innocent people to die inside. When news of the violence spread, miners all over the state began to revolt, and went to war with the coal companies, shooting and attacking soldiers and mine owners, as well as dismantling railroad tracks and blowing mines shut. However, news of the incident was beginning to spread, tarnishing the Rockefellers’ reputation and inspiring more protests. To deal with this problem of public perception, Rockefeller hired public relations pioneer Ivy Lee. Lee was an early influence of Edward Bernays, who would later write the infamous book “Propaganda,” a textbook of mind control for tyrants and aristocrats. Bernays is often called the “father of propaganda.” If this is so, then Ivy Lee is the grandfather. 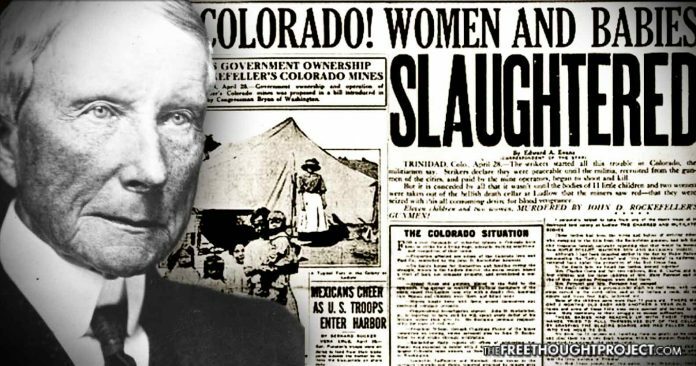 For a short time, Lee and the Rockefellers were able to manage public perception of the event on a national level, although many residents of Colorado were already well-aware of the truth behind the massacre. Eventually, word spread and caused outrage across the country, sparking widespread protests that eventually led to a congressional hearing. As expected, the congressional hearing solved nothing and brought no justice for the families of the slain children and miners. To repair the public image of the Rockefeller name, Lee suggested that the family make high profile donations to various charities and have photographs taken of them handing out money to the commoners to make people think that they were good-hearted and generous.